Andrew lives at Participation House in Brantford, Ontario with his wife, Amanda. Andrew and Amanda both regularly attend recreational therapy programs at Brantwood Community Services in Brantford. 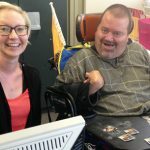 In participating in the GIFTS program, a self-discovery process including those closest to Andrew through the Work-Abilities program at Brantwood Community Services, Andrew realized he has led a pretty amazing life. He discovered he wanted to offer inspiration to people living with disabilities, as well as those without disabilities. Andrew’s goal for writing his book is to provide hope and inspiration for others to never give up on their dreams and aspirations. He want to encourage others to view and use challenges as opportunities instead of hindrances.